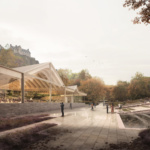 Back in March, The Architect’s Newspaper reported that seven teams (from a pool of 125) had been shortlisted for the Ross Pavilion International Design Competition, an effort to reimagine the city’s prominent West Princes Street Gardens. The winning team will get the chance to replace an existing 1935 bandstand located in the gardens, as well as make “subtle updates” to the grounds themselves, according to a press release. 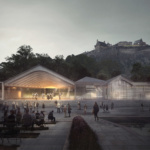 “The revival of this, one of Edinburgh’s best and most prominent sites, is a hugely exciting prospect and we now have seven fascinating design concepts from some of the world’s most in-demand creative minds,” said Norman Springford, chairman of the Ross Development Trust and competition jury chair, in a press release. 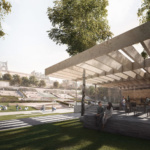 Images of each design concept are available in the slideshow above, while you can find short project descriptions below. 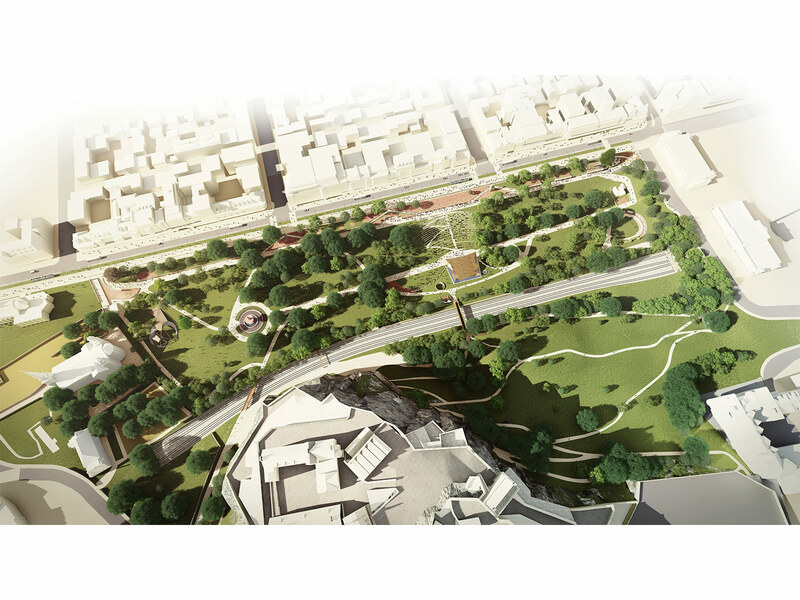 Once a winner has been selected, construction is planned to start in 2018. 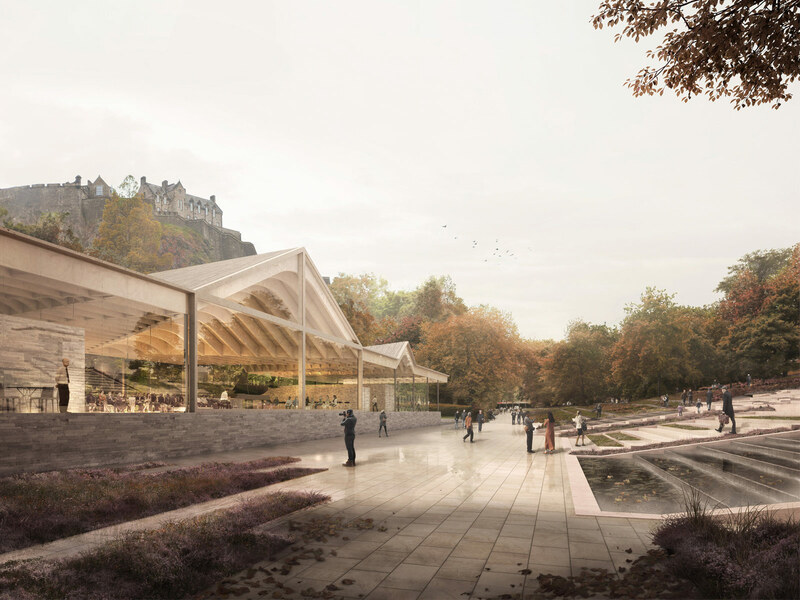 Adjaye Associates’ proposal for the new Ross Pavilion and the reimagined West Princes Street Gardens is a celebration of Edinburgh as a cultural capital and a reflection of the site’s unique topography and location on the verge between the Old and the New Towns. 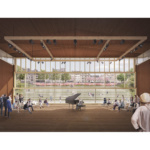 Our scheme honours the legacy and architectural language of the original bandstand that was once the beating heart of the Gardens in the late 19th century, reinterpreting its function and iconography within the contemporary context. 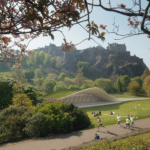 The result is a garden temple responding to the modern-day city, a pleasure pavilion conceived as a sculptural intervention, which serves as a flexible performance space, a community hub and a new icon for Edinburgh. 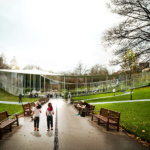 The Pavilion is the focal point of a system of stone-clad outdoor, indoor and in-between public spaces, discreetly embedded into the landscape. 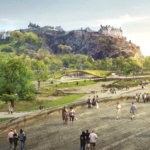 At the meeting between the old and the new, the West Princes Street Garden occupies a central location – geographically, historically, and culturally – in Edinburgh. 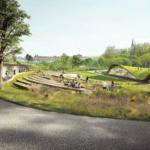 The existing bandstand, in the heart of the Gardens, paradoxically has the feeling of a leftover space that divides rather than unites. 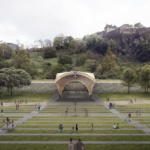 We propose to enhance and reconnect the abundant qualities of the Gardens with a pavilion sculpted by its context: its gently undulating canopy reflects the movement of the terrain below and the light of the sky above. 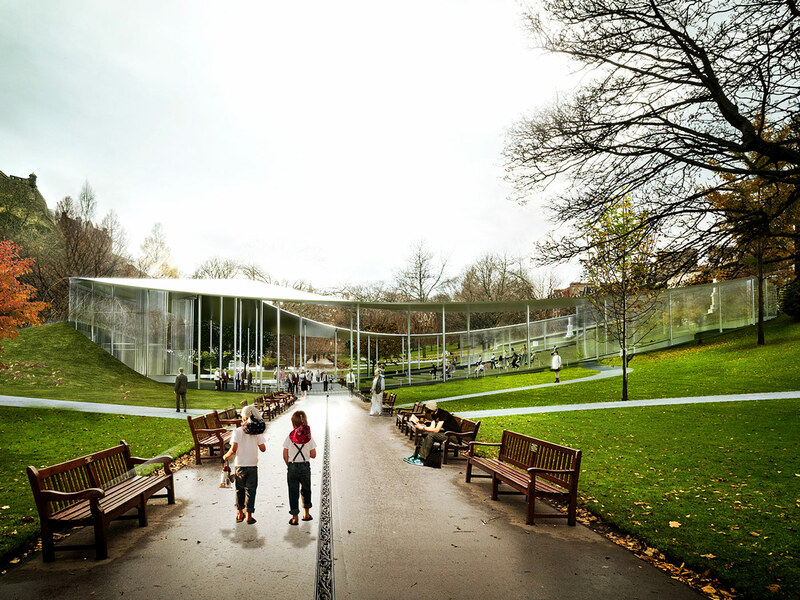 Visual transparency at ground level allows for uninterrupted enjoyment of the Gardens. From within, it will frame the context of Edinburgh Castle and its dramatic setting. 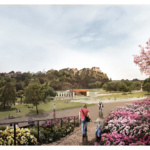 The rejuvenated bandstand provides momentum to reconsider the Gardens at-large by updating the planting regime, opening up key views, and improving access and connectivity throughout. 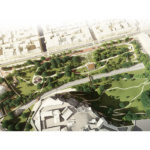 A refreshment of the historic Gardens that roots its future in the heritage of its past. 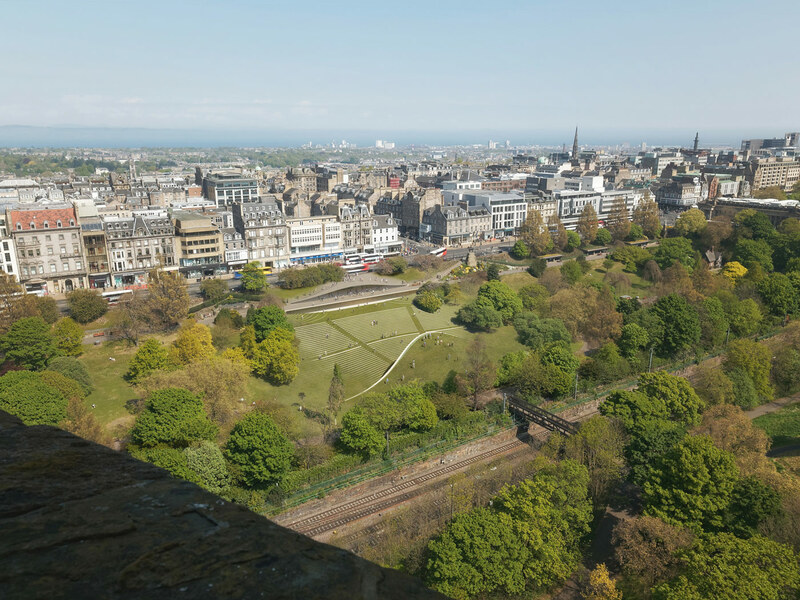 The Gardens form a topographical and visual division between the Old and New Towns, whilst also uniting the people of Edinburgh; a place for people to gather and appreciate the thrilling topography of the city. 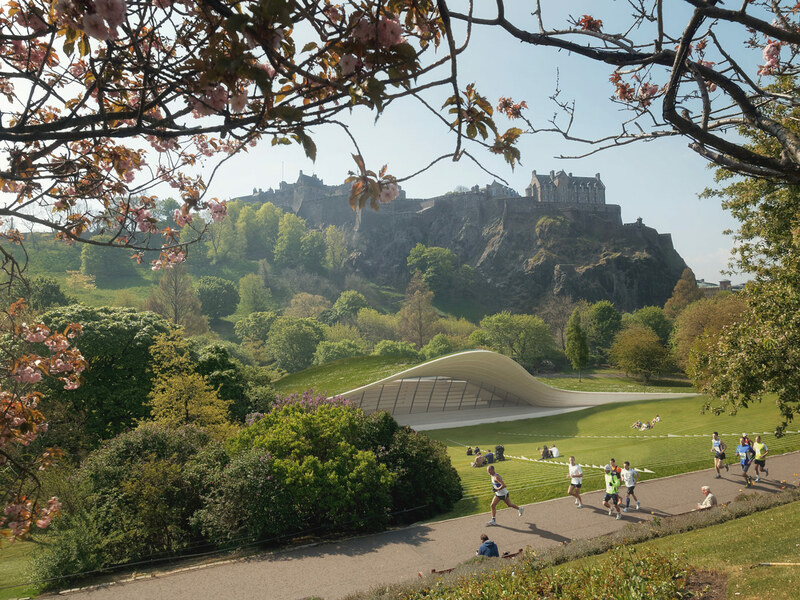 The sinuous landforms of the Performance Space and Visitor Centre reflect the Garden’s natural landscape in contrast with the angular built form of the Old and New Towns. 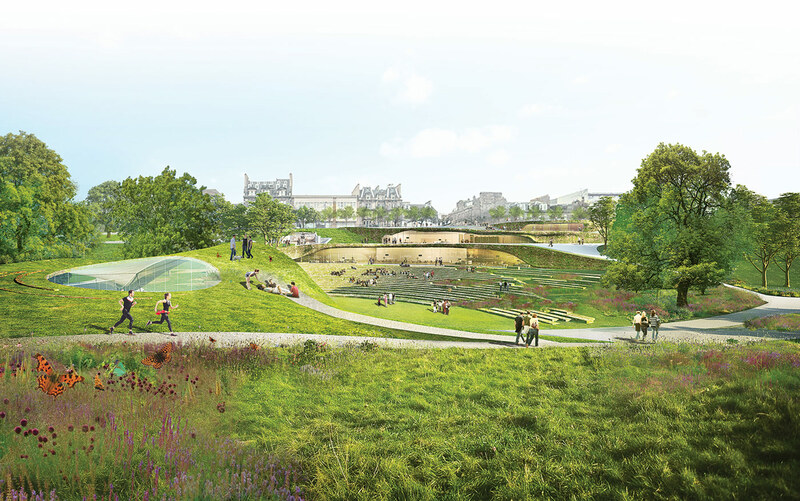 Our proposals aim to make the Gardens more connected to the city with a dramatic and accessible sense of arrival for all at the Visitor Centre. 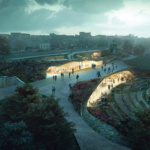 This is a project of contrasts; between the New and Old Towns and the Gardens that separate them and between quiet tranquil days in the Gardens and vibrant large-scale public events. 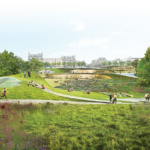 Our concept is based on creating an architecture that can perform equally well with each of these contrasting modes of behavior. 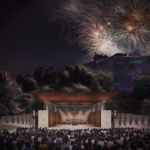 Our design solution is based on understanding how our interventions can be both introverted when the gardens are quiet, and extroverted during the celebrations and events. 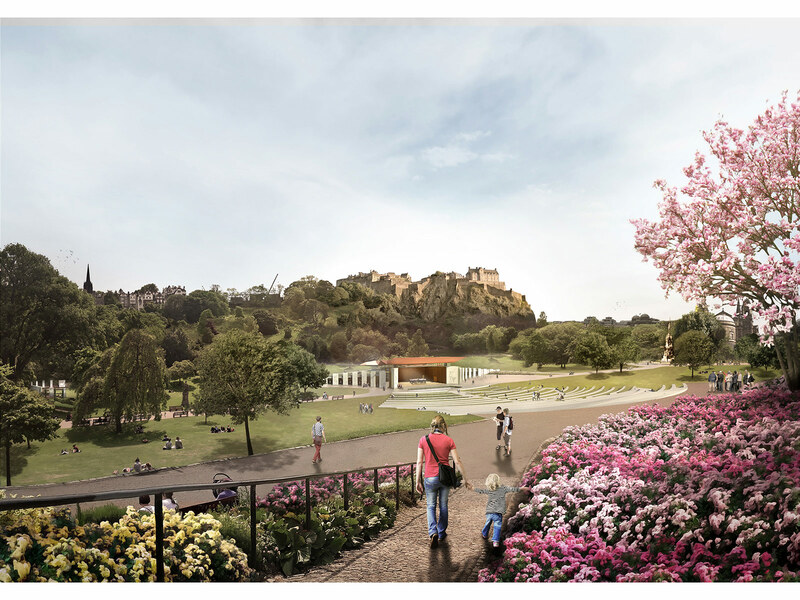 Princes Street Gardens, linking the New Town to Old, is a landscape for viewing the spectacular setting, a garden of commemoration, and a garden to enjoy. 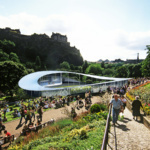 The lengthy flower bank to Princes Street is world unique. 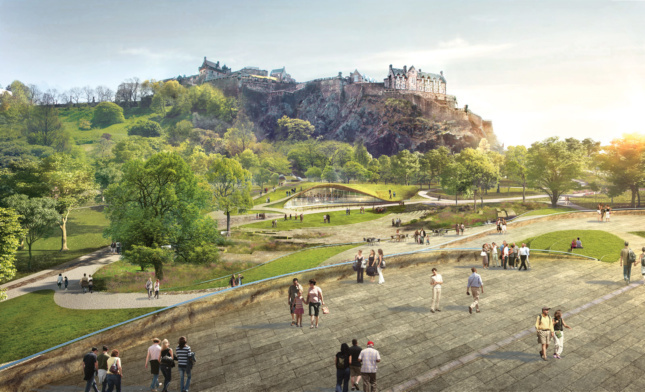 Our strategy is simple: we leave this alone. 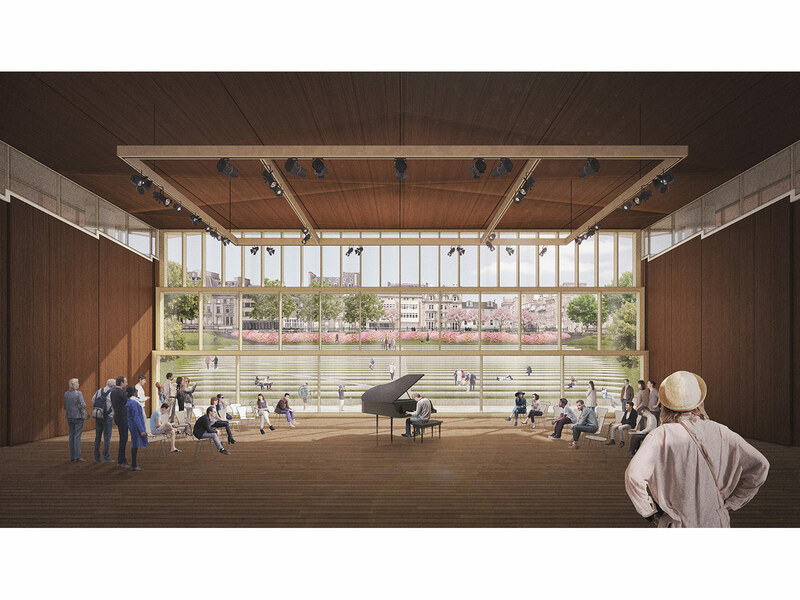 Splendid new entrances, self-evident way-finding, and a re-visioned ‘Blaes’ area provide for contextual augmentations to a new Ross Pavilion which includes a combined visitor center and performance venue. 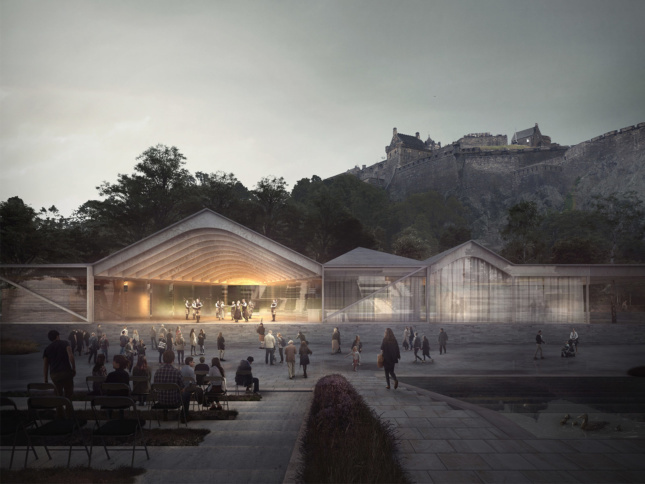 How can the Ross Pavilion offer a new world-class cultural venue not just for Edinburgh, but the whole of Scotland? 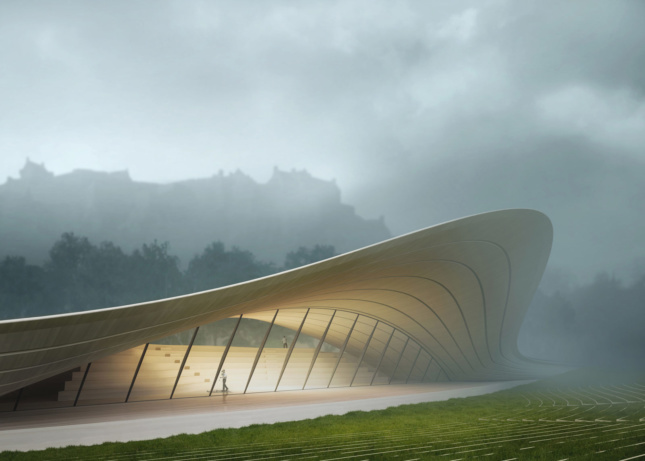 The Ross Pavilion will be the focal point of the city of Edinburgh and its many visitors, but it can also be a symbolic place for all of Scotland as well. 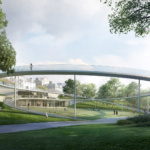 The intervention into the Gardens is therefore conceived as a facility for the entire nation, indeed it is a project that has the potential to capture the imagination of people across the country. 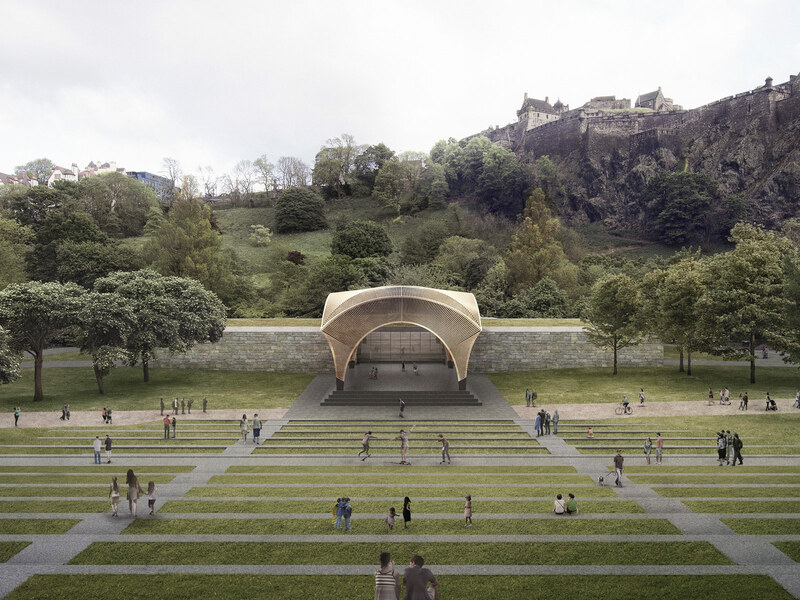 For the Ross Pavilion, we propose a public asset that can not only perform as a modern performance venue, but a visitor experience that explores the varied landscapes and histories of the Gardens and the terrains of Scotland beyond. 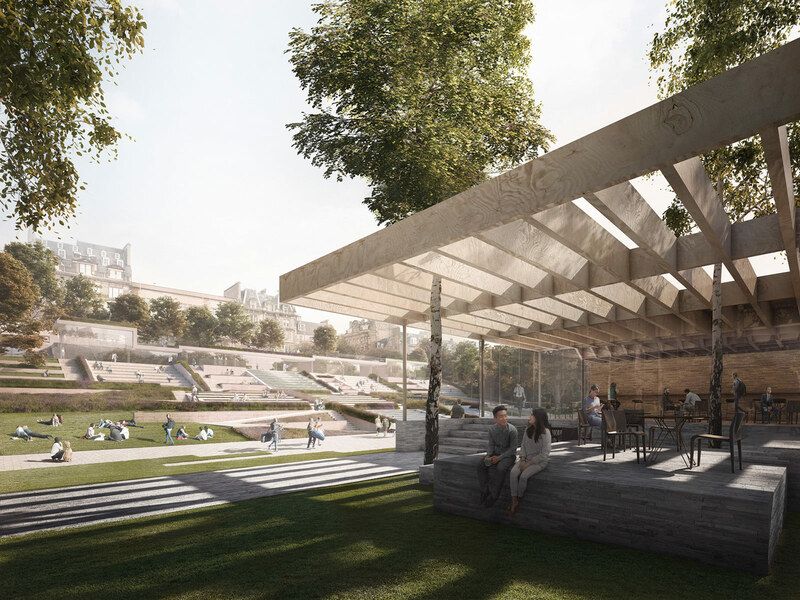 A simple but bold design allows us to propose a venue that can host the wide variety of functions the pavilion calls for. 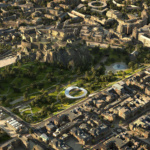 Furthermore, it offers us the flexibility to propose a wider range and intensification of human activities in the Gardens and unleash the incredible potential the site has for Edinburgh. 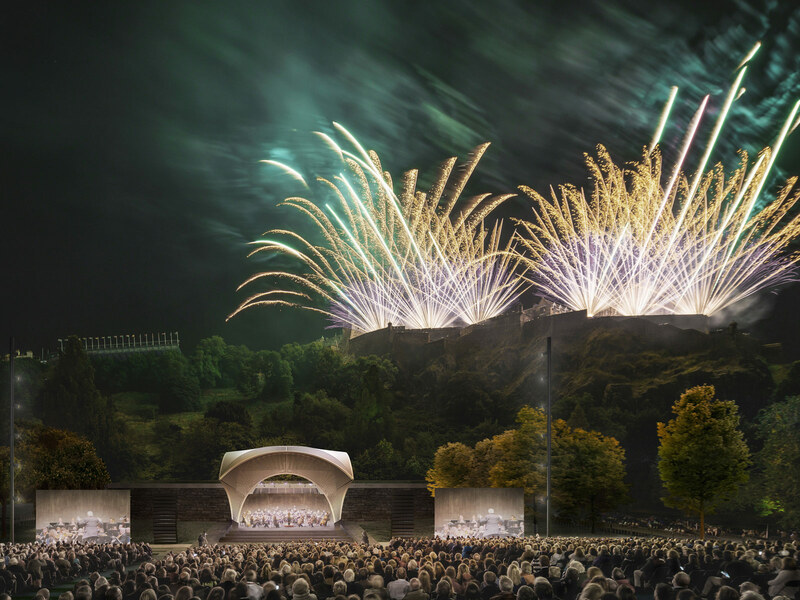 For that matter it can tap into the long history the city’s backdrop has had for inspiring some of mankind’s highest achievements in the arts, literature, philosophy, and science. 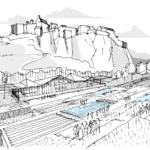 Our approach to the architecture and landscape has been that of sensitive interventions into the historic fabric of the Gardens. 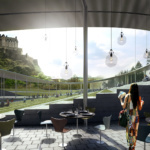 Elements are formed from their context and crafted from quality and timeless materials, and completed with water terracing that recalls the Nor Loch. 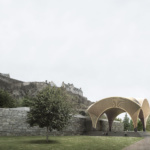 The word ‘pavilion’, from the Old French for butterfly (papillion), parsed through the pictogram of a highly-decorated tent, evokes the fluttering canvas and heraldry of a field campaign with a glorious connection between nature and humankind. 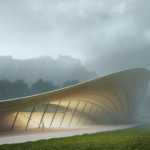 The butterfly is unity of symmetry and organic form, whose lines can be traced and followed, eagerly denoting meaning. 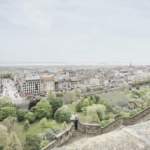 Occasionally alighting, it is of the air but connects with the ground. 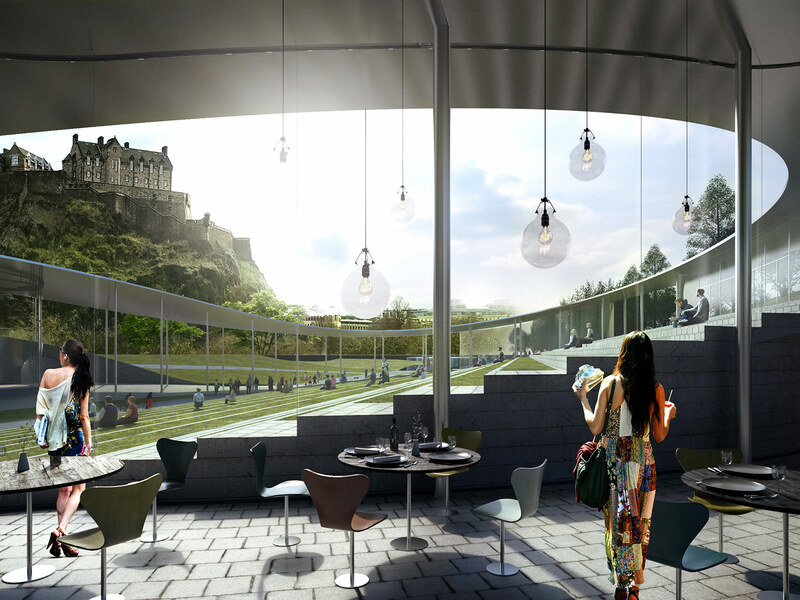 It delights and draws you in. And so it is with this new ‘pavilion’. 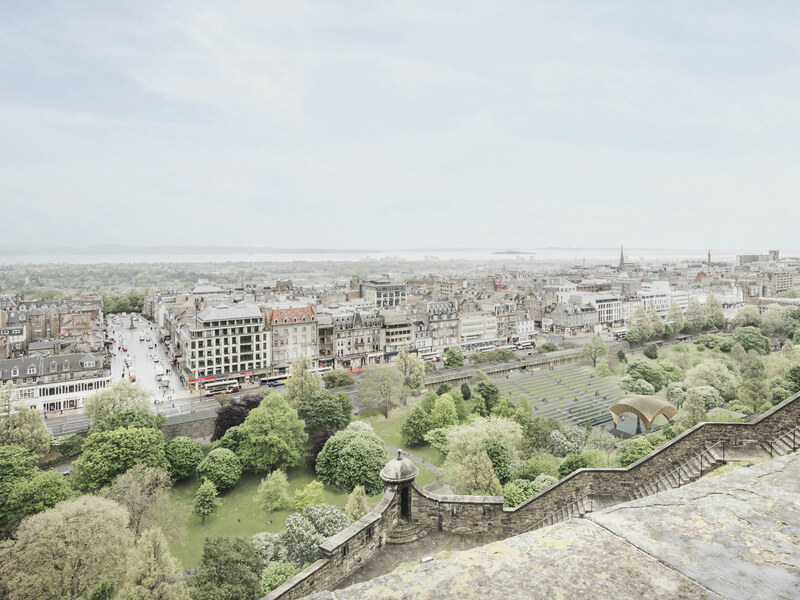 Pleasure will be drawn from rock and fold, from seam and segue. 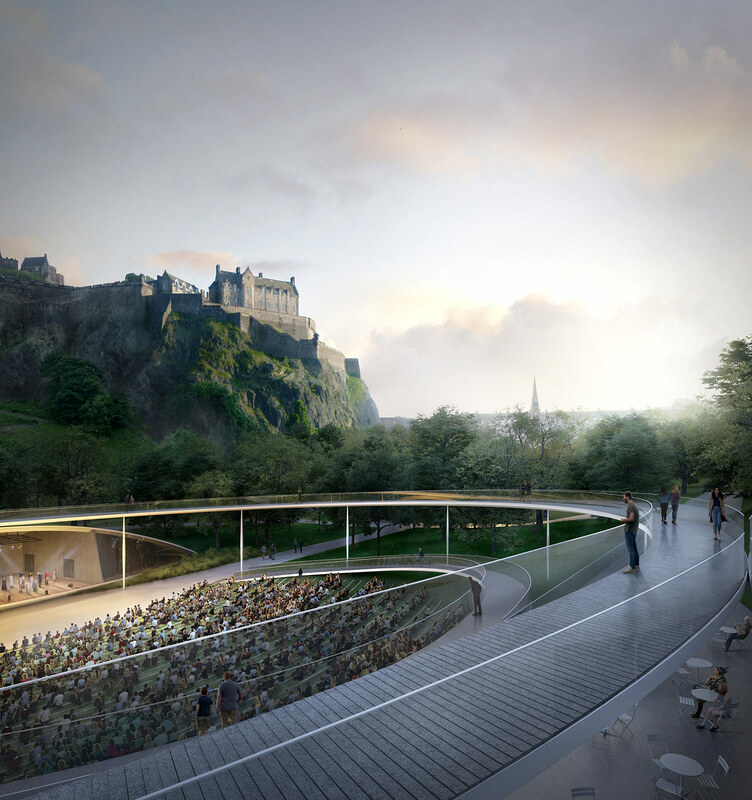 There are glimpses of history and the promise of a performance. 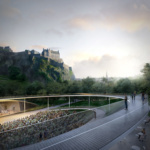 People will connect through their common story and shared song. 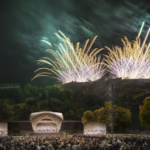 There is music in the air. 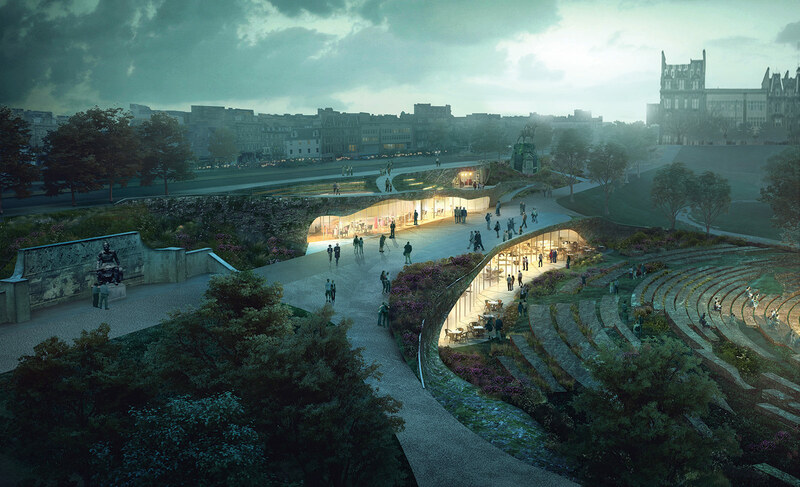 Light, space, sound, and poetry. 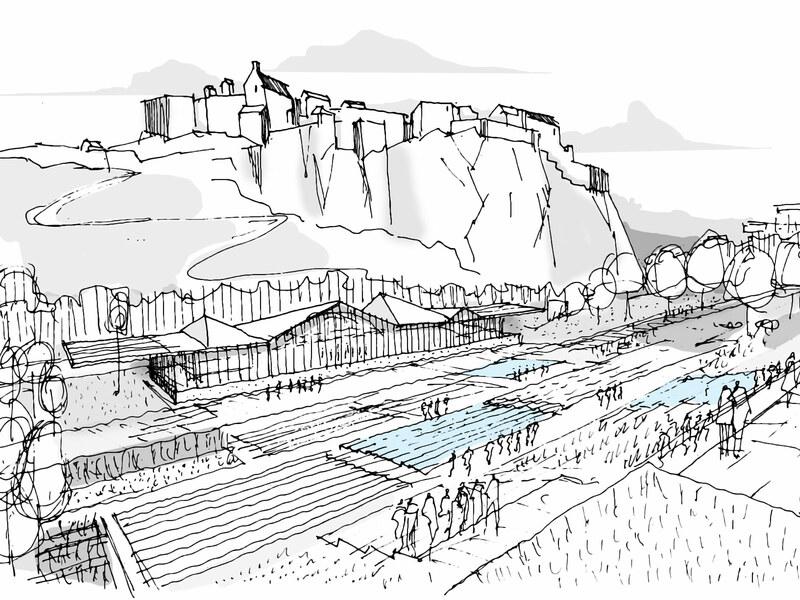 Castle, rock, garden, and fountain. 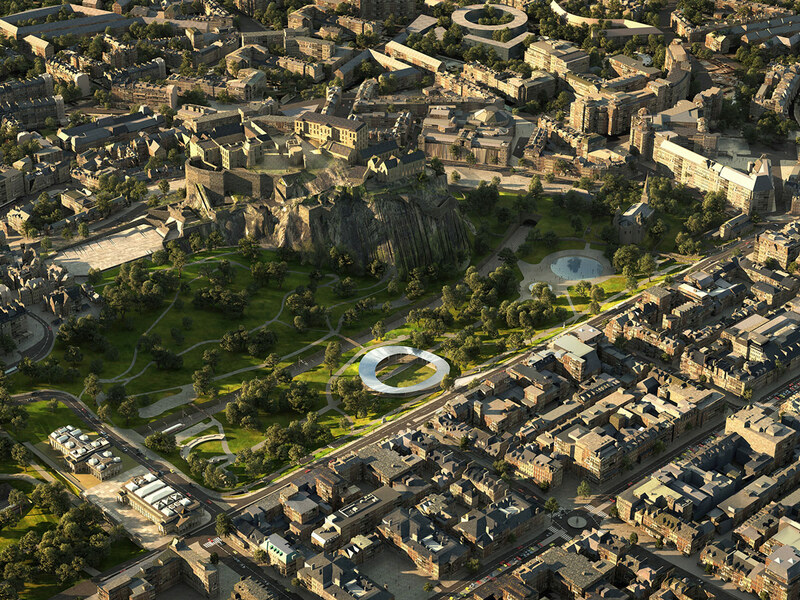 Without nature, the city is lifeless. 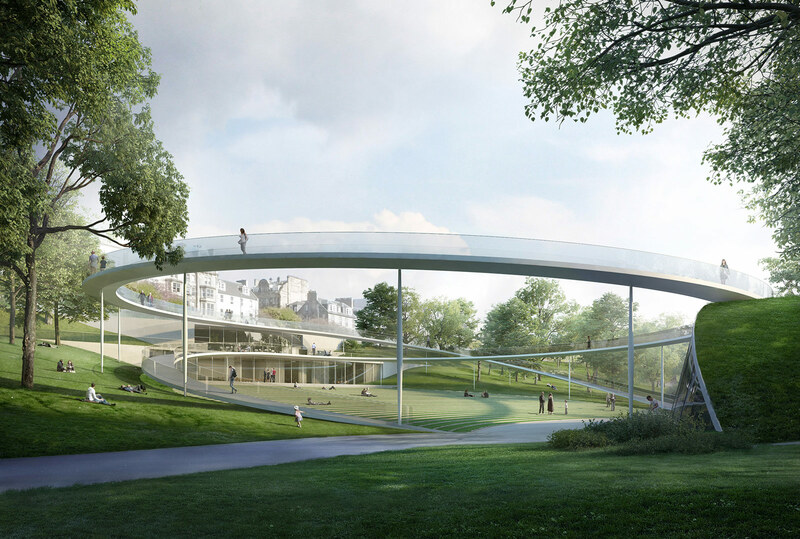 This is a place for people and their perpetual delight. 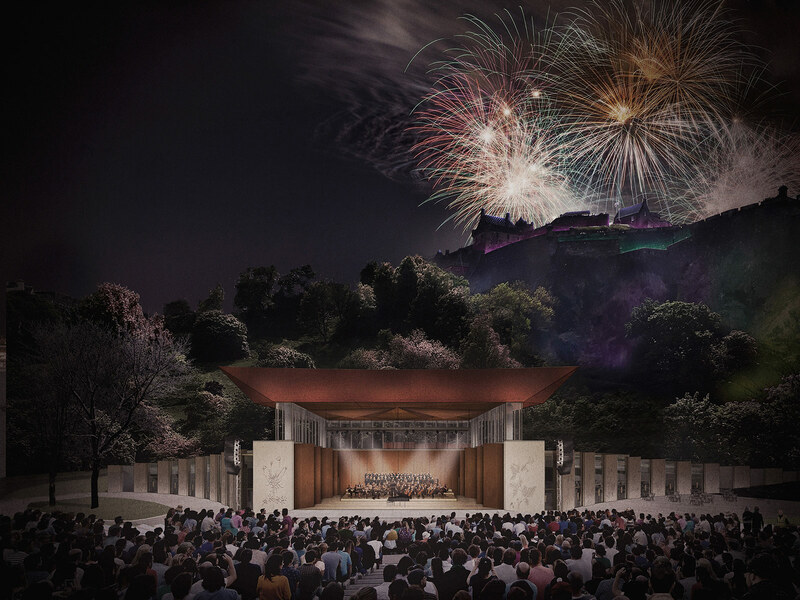 These four words defined both the brief and our response—a place for people to gather and celebrate the performing arts in one of the global capitals of culture. 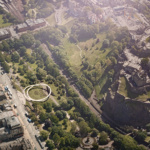 The inspiration for the project came from Celtic spirals, the remarkable stone circles of Orkney and the circular forms of the original Bandstand, the Ross Fountain and the Royal Scots memorial. 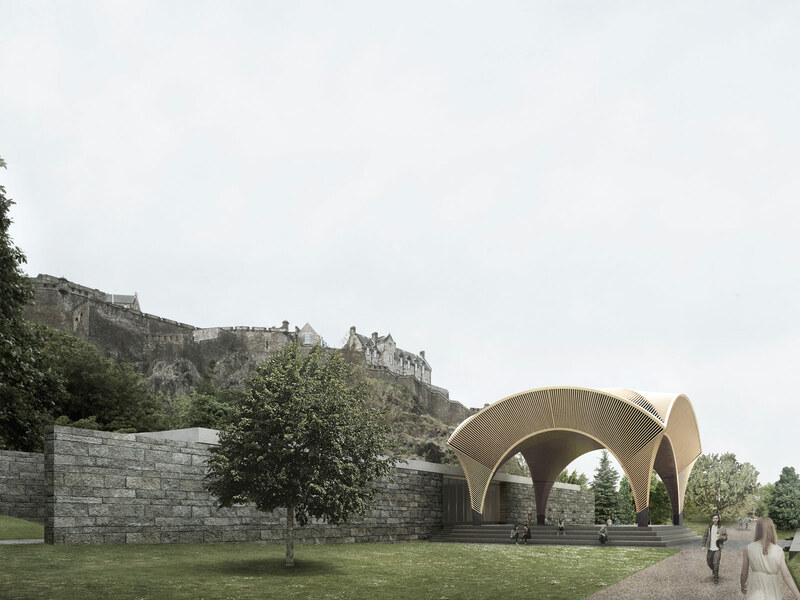 They were reinterpreted to create a new typology of pavilion and viewing platform for the West Princes Street Gardens. 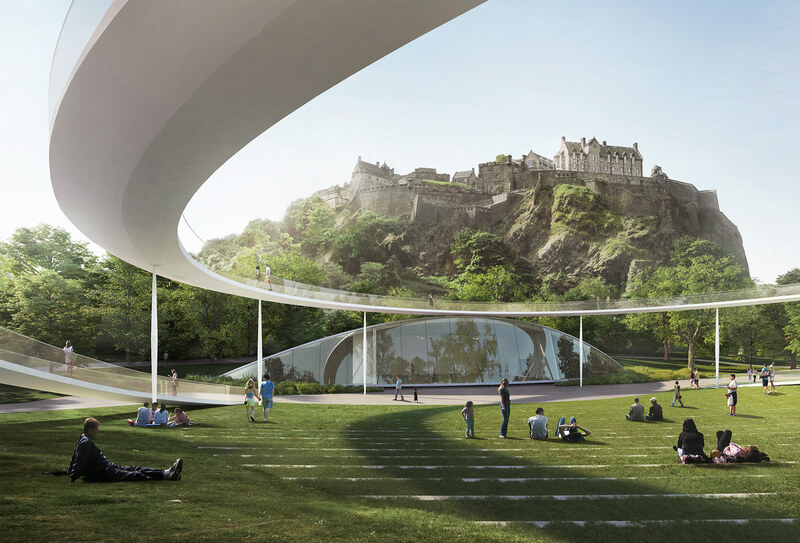 The proposal is a powerful landmark symbolizing the unity of Edinburgh: its history, originality, art, and culture. 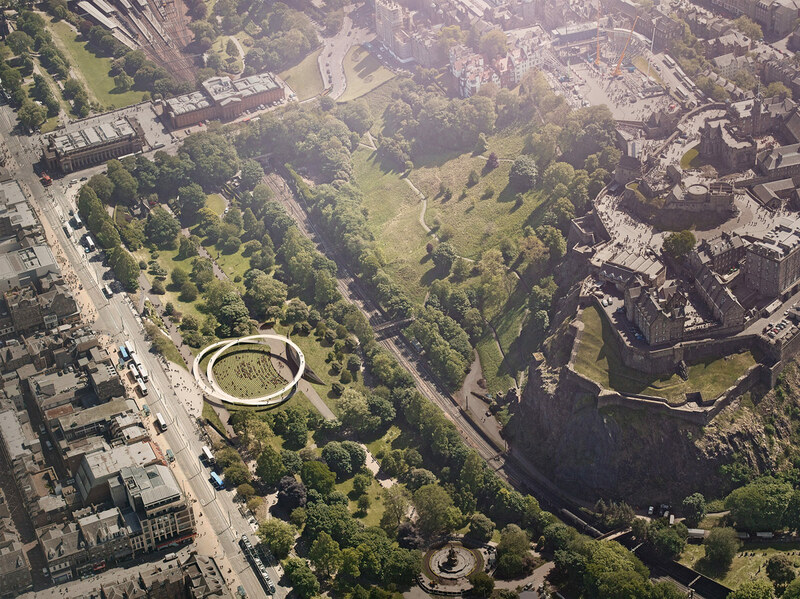 The rings offer new panoramic views of the important heritage sites of the city. 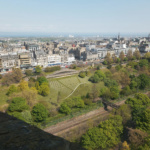 They connect the New Town, the Castle and the Old Town without disturbing the existing axial paths of the Gardens. 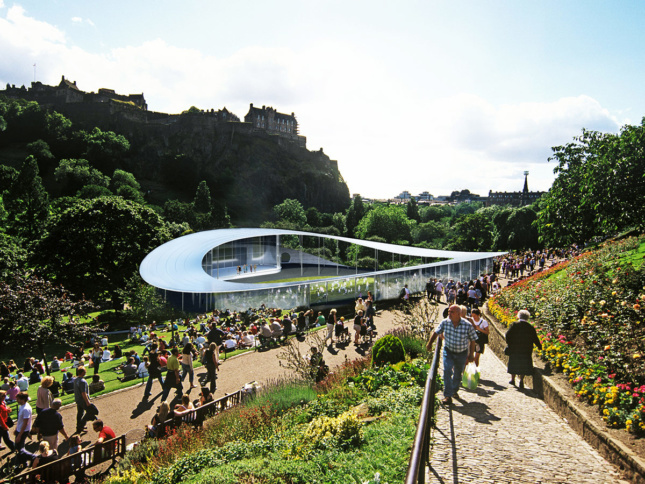 Contrasting with the light and floating spiral are the Visitor Centre and the Performance Space. 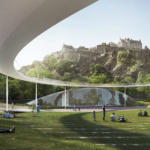 They blend into the urban context of Princes Street on one side and the Gardens on the other, ready to come alive for the cultural events for which Edinburgh is famous.